If you want a yard that is colorful but easy to maintain, take some tips from this makeover. As we promised, throughout the fall and winter we’re bringing you articles on the Front Yard Competition that was held as part of the National Garden Festival in Buffalo this summer. 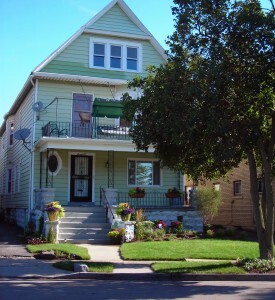 Today we’ll take a look at 80 North Parade St., designed by Elbers Landscape Service, Inc.
Before the makeover, three yew bushes were planted to the right of the front steps, filling up the entire area from the porch to the bottom of the steps. That was low-maintenance, but definitely not colorful. 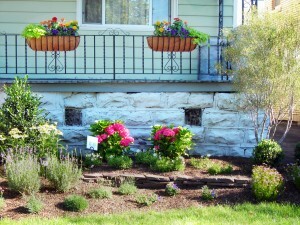 The bushes were pulled out and replaced with a perennial bed, which you can see in the photos above and at right. A wall of lilac flagstone creates an upper tier to the bed, which adds an interesting spillover effect to the garden, explained Brendan Grabowski, lead foreman for Elbers. He worked on the project with Mike Szczudlik. 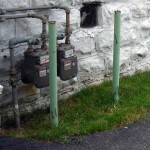 Perennials in the garden are easy maintenance. “In the fall, you can hack them to the base, and they’ll come back the next year with just as much color,” Grabowski said. There had been a grassy strip along the driveway, and Elbers replaced the grass with the lovely garden seen at left. While grass is usually considered low maintenance, the strip along the driveway created a real problem for the homeowner. The trouble was the meters, which you can see at the far end of the garden in the photo at left, as well as in the “before” shot at right. Imagine trying to mow around all that! 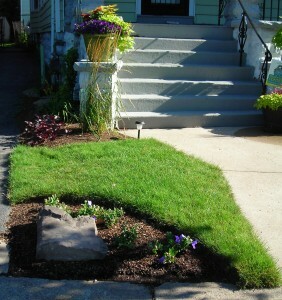 Elbers replaced the grass with colored stones, seen below right. 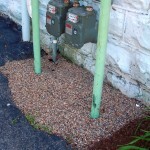 The trick to using stones, Grabowski said, is to keep them flush with the surrounding surfaces. Never mound the stones. That way they won’t roll out of place and end up where you don’t want them. “You can plow right across that” and the stones will stay put, he said. Use curves. Areas that use only sharp angles and rectangular shapes tend to be less interesting than those with curved lines. Even though the lines of the sidewalk and driveway dictated some straight lines, Elbers introduced a simple curve that adds interest. Use mulch. Mulch helps keep weeds out, which makes your garden easier to maintain. 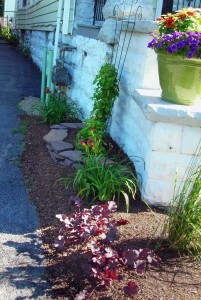 Mulch also makes your garden look complete, even if you’re waiting to perennials to fill up the space. Use rocks. Rocks add interest to your garden, and they’re about as low maintenance as you can get!